Throughout fairy tales, there is a set of characters. Fairy tales can be full of princesses, witches, kings, evil stepsisters, and even tricksters. Each fairy tale emphasizes a certain meaning behind the story that could relate to every day life. In fairy tales, tricksters symbolize aspects of life. Tricksters seem to be innocent, but in reality they are not. Tricksters use the disguise of innocence in order to achieve certain goals. Within the fairy tales Jack and the Bean Stalk by Joseph Jacobs, Cagliuso by Giambattista Basile, and The Wolf and the Fox by the Brothers Grimm, each trickster uses the seeming of innocence to get what he or she wants. In Jack and the Bean Stalk, Jack is the trickster. Jack uses his innocence as a disguise in order to steal valuable items from the ogres to better his family. In the beginning of the story, Jack’s mother gets angry with him for selling their cow for magical beans (Jacobs). Because Jack’s mother underestimated his gains, he climbs the beanstalk and innocently says to the ogre woman, "Good morning, mum," in a quite polite-like manner, “Could you be so kind as to give me some breakfast” (Jacobs)? After the ogre woman responds, Jack replies with, “Oh! please, mum, do give me something to eat, mum. I’ve had nothing to eat since yesterday morning, really and truly, mum” (Jacobs). Jack sounds innocent because not only is he polite, but he also sounds humble in searching for something to eat. Because of his humble attitude and child-like innocence, the ogre did not suspect Jack to be a thief. Jack tricked the ogre into believing he was at her house because he was starving, so that he could sneakily steal a bag of gold to bring back to his family. When Jack returned a second time to the ogre’s house, he politely lied and acted as if he did not know what happened to the bag of gold when the ogre woman asked if he had seen it. More specifically, he responds to the ogre woman with "That’s strange, mum. I dare say I could tell you something about that but I’m so hungry I can’t speak till I’ve had something to eat” (Jacobs). Jack’s response sounded innocent because he made light of the situation and tricked the ogre into believing that Jack is just a starving, helpless child. When the ogres were not looking, he ran off with the hen that laid golden eggs. Therefore, trickster Jack used his politeness and innocence to distract the ogre into thinking he was starving in order to reach his goal of redeeming himself to his mother and by gaining more wealth for his family below the beanstalk. According to Robert Benjamin, “The fundamental purpose of a trickster and a mediator is the same: to help the characters or parties survive” (Benjamin135). In Jack and the Beanstalk, Jack used his innocence as a disguise to trick the ogres and steal from them to ensure his family’s survival. Tricksters can be interpreted as mediators because they balance conflict with necessary analytical skills and intuitive sensibilities. The trickster figure is a universal figure, which thrives on conflict and change. He either causes conflict or resolves it by serving as a mediator in “order to reconcile irresistible forces” (Benjamin 135). In folklore, the trickster helps humans cope with uncontrollable forces. An example would be helping humans cope with hierarchy. Most of the time, tricksters cannot resolve these problems single handedly (Benjamin 135). This is why tricksters use manipulative tactics and innocence as a disguise to serve their purpose as mediators. Even though in Jack and the Beanstalk, trickster Jack takes on the identity of a person this does not mean that a trickster has to a human. For example, in Cagliuso, the trickster happens to be a female cat. When Cagliuso’s father died and Cagliuso inherited his father’s cat, he was upset. The cat responded by saying, “You’re lamentating too much. You have more luck than you realize because I’m capable of making you rich if I put my mind to it” (Basile 394). This statement was the turning point in the cat’s determination to become a trickster in order to make Cagliuso rich. The cat brings small offerings to the king, pretending the gifts are from Cagliuso and eventually the king wants to meet Cagliuso. The cat replies to the king’s desire for the meeting by saying, “The Lord Cagliuso sends his apologies. He cannot come because last night some of his servants made off with everything and left him with no shirt on his back” (Basile 395). This cat’s response, along with the small offerings given to the king, make Cagliuso seem innocent because of his apology and because he has humbly given gifts to the king while not asking for anything in return. This lie caused the king to conclude that Cagliuso was rich because he “owned servants.” The cat knew that this lie would not only cause the king to relate to Cagliuso because he believes they are both wealthy, but it also made Cagliuso a suitable match for the king’s daughter. All of the innocent offerings the cat brought to the king lulled the king into believing the cat and therefore he never suspected the cat was lying. As a result of this successful deception by the trickster cat, beautiful clothes were delivered to Cagliuso from the king. Moreover, the cat was so determined to make Cagliuso rich that she even lied to the shepherds and herders. In doing so, she states, “Ho there, pay attention! There is a band of robbers who are ransacking everything…you must say that everything belongs to Lord Cagliuso and they won’t touch a hair on your heads” (Basile 394). These exclamations made by the cat seem innocent because the herders and shepherds believed she was trying to protect them from harm. Furthermore, the cat also knew that this lie would cause the king to believe that Cagliuso owned a lot of land and was a rich man fit for his daughter. All of these tricks were disguised as innocent statements or gestures to gain the king’s trust in Cagliuso. The cat used her wit and seemingly innocence in her determination to trick the king in order to achieve the goal of Cagliuso’s marriage of the king’s daughter, which would result in Cagliuso becoming very rich. According to Cogley in his article “Trust and the Trickster Problem,” trust involves relying on someone’s good will (32). Cogley calls this reliance “the trickster problem.” Tricksters rely on others’ good will in order to get them to go along with their scheme (Cogley 30). An example is how the cat in Cagliuso used her innocence as a disguise by bringing the king gifts to gain the king’s trust. This disguised innocence caused the king to not suspect anything and ultimately was afoul and to ultimately fall for the cat’s tricks. When it comes to understanding cats as tricksters, Maria Nikolajeva describes them as carnival figures because they usually challenge higher authority figures and attempt to turn order into chaos (Nikolajeva 254). More particularly, according to Nikolajeva, cats are described as magical helpers in fairy tales in order to assist heroes or their masters in the transformation from an ordinary life to a more magical life (Nikolajeva 260). 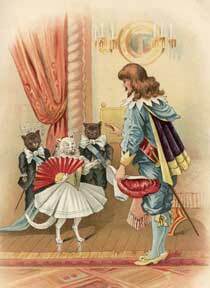 Therefore, in the fairy tale Cagliuso, the cat employs both the trickster and magical cat aspects of a folklore cat because the cat deceives the king in order to magically help Cagliuso become rich and attain a more satisfying life. In the Brothers Grimm fairy tale, The Wolf and the Fox, the red fox knows that he is weaker than his master, the wolf; therefore, the red fox’s goal eliminate the wolf. The red fox knows that in order to be free from his master, he has to follow the wolf’s commands to avoid being eaten. In the story, the fox seems innocent because he willingly follows the wolf’s commands, but the fox does this in a clever way in order to escape from the wolf in the end. For example, the wolf commands the red fox to obtain something for him something to eat. The fox replies, “I know a man who has been killing, and the salted meat is lying in a barrel in the cellar. We will get that (Grimm, Jacob, Wilhelm Grimm, Jack Zipes, and Johnny Gruelle 268).” When they arrived ate the cellar, the fox hid in a hole as the wolf ate undisturbed by himself. The wolf initially did not understand why the fox was hiding, but was satisfied when the fox replied cleverly, “I must see that no one is coming. Don’t eat too much (Grimm, Jacob, Wilhelm Grimm, Jack Zipes, and Johnny Gruelle 268).” The fox’s reply to the wolf appeared innocent because the wolf assumed the fox was protecting the wolf from being caught by the farmers. The fox uses his wit and cleverness to ensure that the wolf is distracted into trusting him rather than devouring him. In reality, the fox is tricking the wolf to get rid of him. The fox was not actually trying to benefit the wolf, but was instead protecting himself. The fox knew that the wolf had eaten too much to run from the wrath of the farmers. Therefore, when the farmers arrived, the wolf was killed while the fox stayed hidden and happily escaped by using his innocence as a disguise to achieve his goal of being rid of his master. According to Will-Erich Peuckeret’s extensive data in 1930 and 1940, the red fox appears in myths all over the world and exists in two forms. These two forms are described as follows: “The dog and the wolf, a divine or demonic being,” or “ a born deceiver who dupes bear and wolf in particular, yet often loses to the other weaker animals” (Uther 138). Sometimes when extensive human behavior is contained in the fable or fairytale, the fox can be the deceiver and the deceived. In many cultures, especially European culture, the red fox is portrayed as cunning and ingenious, but also wicked (Uther 133). For instance, in the fairytale previously referenced The Wolf and the Fox, the red fox was both cunning and ingenious in reaching his goal of escaping and deceiving the wolf. In addition, throughout Jack and the Beanstalk, Cagliuso, and The Wolf and the Fox, each trickster used his or her seeming of innocence in order to achieve his or her goals. Jack was a mediator; the cat in Cagliuso was a magical helper, and the fox in the Wolf and the Fox was the deceiver. Therefore, in cultures all over the world, tricksters use their disguise of innocence in order to gain their victims’ trust in order to achieve his or her ultimate goal in the end. Basile, Giambattista. "Cagliuso." The Great Fairy Tale Tradition. Ed. Jack Zipes. New York, NY: W.W. Norton & Company, Inc., 2001. 394-97. Book. Benjamin, Robert D. "The Mediator As Trickster: The Folkloric Figure As Professional Role Model." Mediation Quarterly 13.2 (1995): 131-149. Business Source Complete. Web. 19 Apr. 2015. Bernheimer, Kate, and Carmen Giménez Smith. My Mother She Killed Me, My Father He Ate Me: Forty New Fairy Tales. New York: Penguin, 2010. Print. Cogley, Zac. "Trust And The Trickster Problem." Analytic Philosophy 53.1 (2012): 30-47. Academic Search Premier. Web. 19 Apr. 2015. Grimm, Jacob, Wilhelm Grimm, Jack Zipes, and Johnny Gruelle. The Complete Fairy Tales of the Brothers Grimm. Toronto: Bantam, 1987. Print. Jacobs, Joseph. "SurLaLune Fairy Tales: The Annotated Jack and the Beanstalk." SurLaLune Fairy Tales: The Annotated Jack and the Beanstalk. N.p., n.d. Web. 05 Mar. 2015. Nikolajeva, Maria. "Devils, Demons, Familiars, Friends: Toward A Semiotics Of Literary Cats." Marvels & Tales 23.2 (2009): 248-267. Literary Reference Center. Web. 18 Apr. 2015. "Story Lovers World Home Page - Right Frame." Story Lovers World Home Page - Right Frame. N.p., n.d. Web. 20 Apr. 2015. Tenney, Shawna. "Shawna JC Tenney: January 2011." Shawna JC Tenney: January 2011. N.p., n.d. Web. 20 Apr. 2015. "The Wolf And The Fox." By Raskina on DeviantArt. N.p., n.d. Web. 20 Apr. 2015. Uther, Hans-Jörg. "The Fox In World Literature." Asian Folklore Studies 65.2 (2006): 133-160. Humanities International Complete. Web. 18 Apr. 2015.